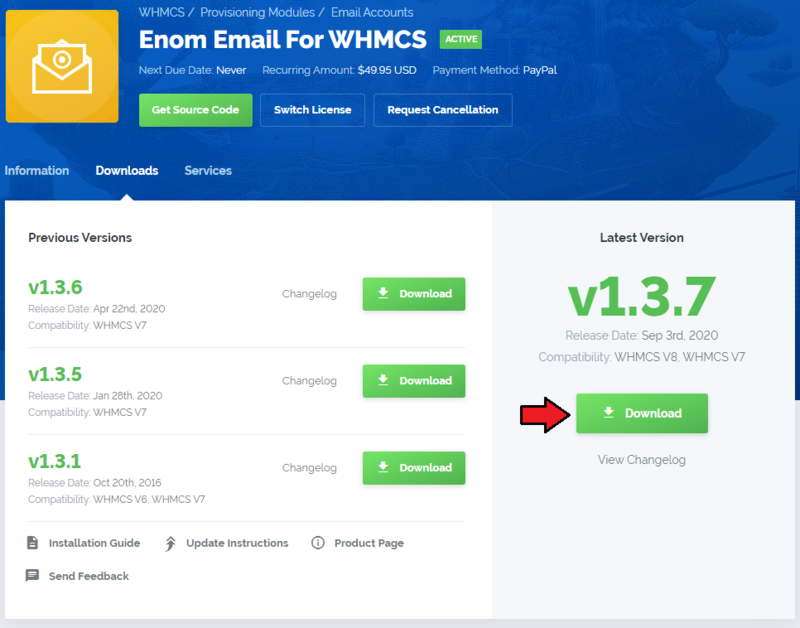 Enom Email For WHMCS is a self-explanatory module created to automate provisioning and management of Enom email accounts in your WHMCS. 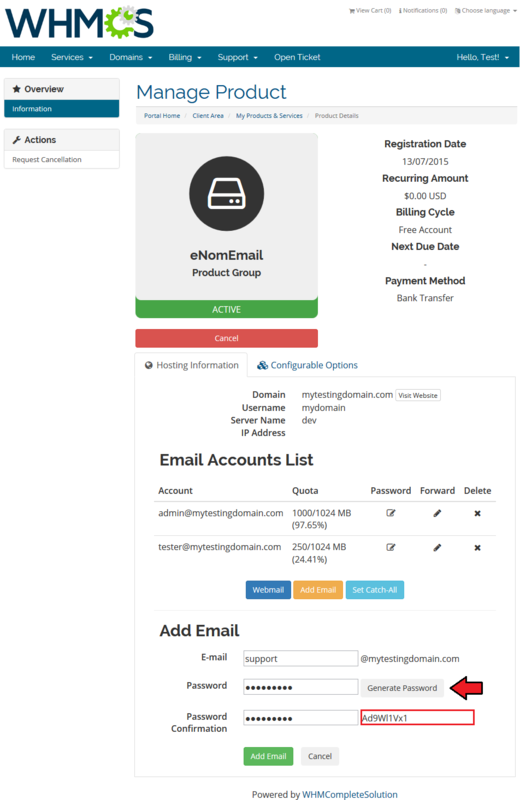 It allows your clients to manage their mailboxes and forwarders without accessing Enom Email, straight from your WHMCS client area. 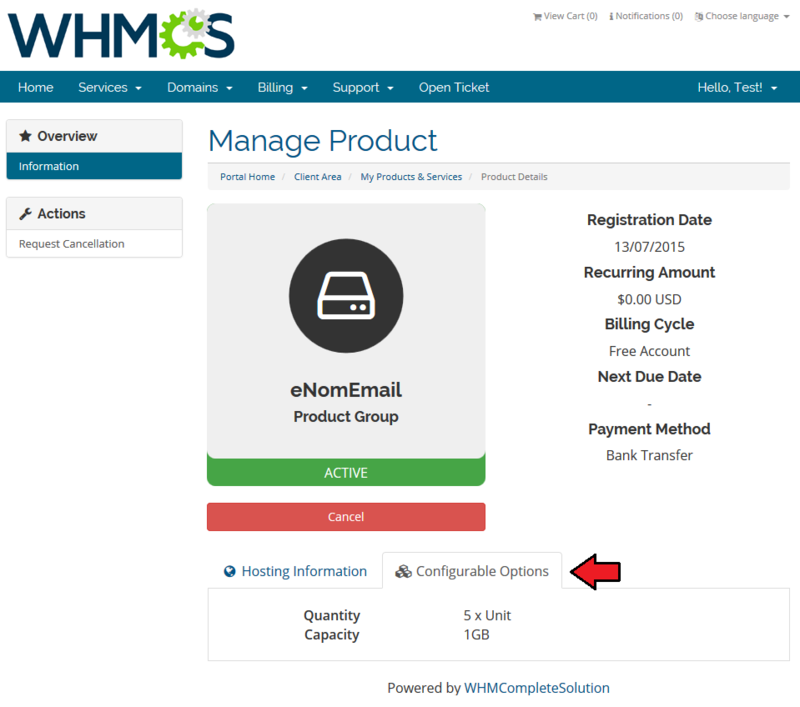 This tutorial will show you how to correctly install and configure Enom Email For WHMCS. 4. 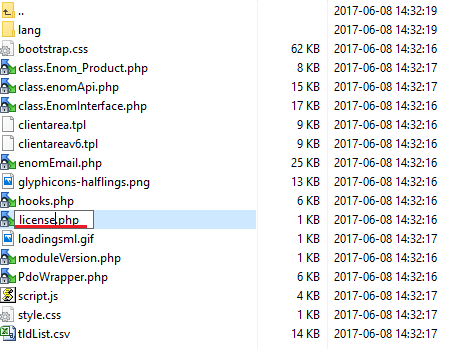 When you install Enom Email For WHMCS for the first time you have to rename 'license_RENAME.php' file. The file is located in 'modules/servers/enomEmail/license_RENAME.php'. Rename it from 'license_RENAME.php' to 'license.php'. 6. 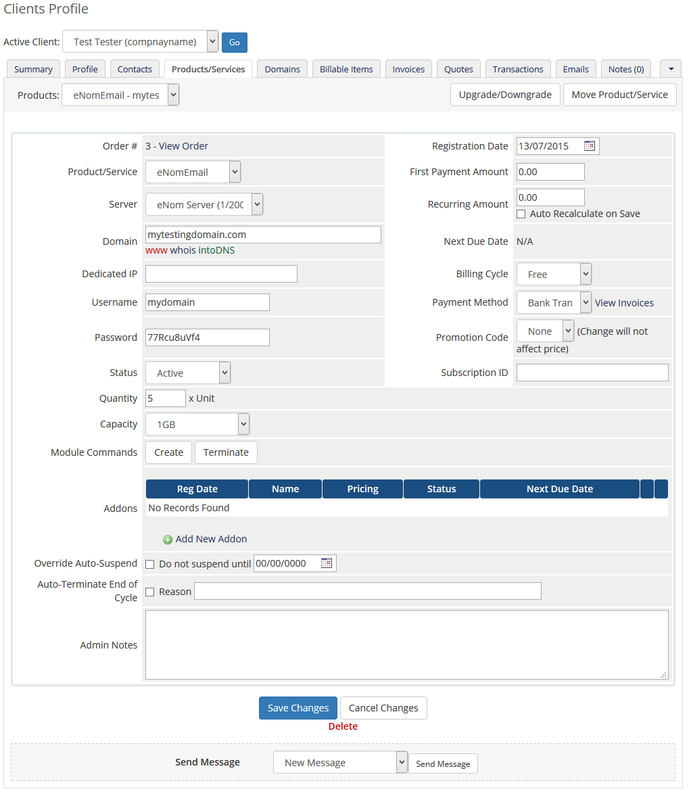 Now we will show you how to configure a new product. To do so, log in to your WHMCS. Press 'Setup' → 'Products/Services' → 'Servers'. Afterwards press 'Add New Server'. 7. Next, fill in your server name (or IP address), username and password. Choose 'EnomEmail' from a dropdown menu and press 'Save Changes'. 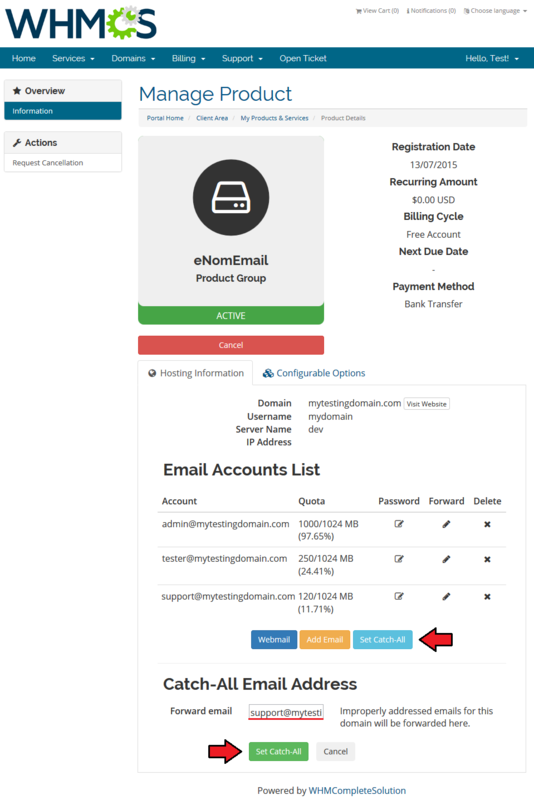 It is important to use username and password from your Enom account. Since you leave hostname blank, module connects with Enom on http://www.enom.com/. Username and password are the only means that will let you be recognized by Enom servers. 8. After you configure your server correctly, you will see a following screen. Now you need to create a new group for your server. For that purpose press 'Create New Group'. 9. Enter name, click on your previously created server, press 'Add' then press 'Save Changes'. 10. In order to create and configure the product, click on 'Setup' → 'Products/Services' → 'Products/Services'. 11. 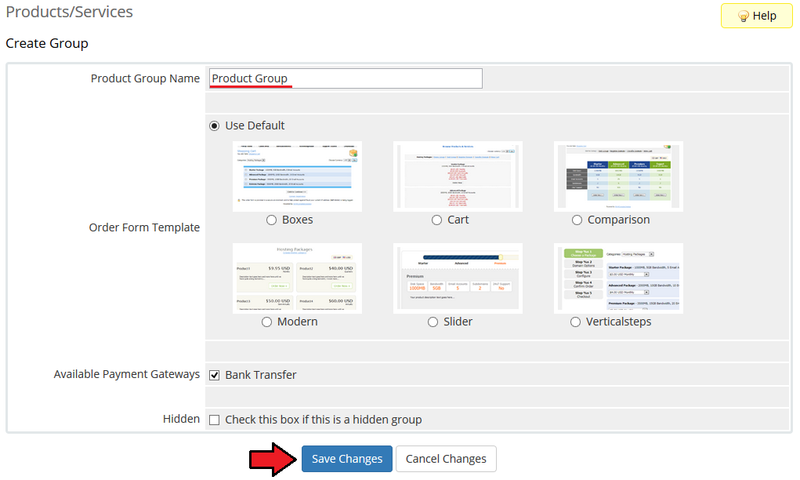 Fill in product group name and press 'Save Changes'. 12. When you have a product group, you can create your product. 13. Afterwards, choose your product group from a dropdown menu, enter your product name and press 'Continue'. 14. 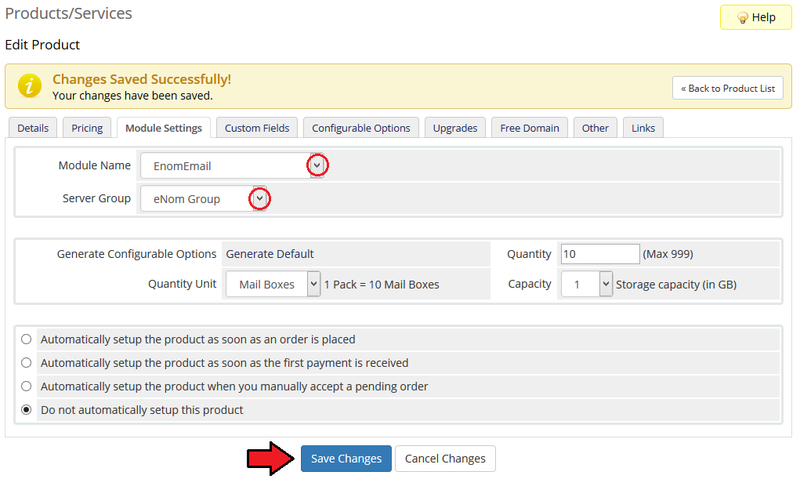 Now, go to 'Module Settings' section, choose both 'EnomEmail' and your previously created server group from dropdown menus and press 'Save Changes'. Finally, if you wish you may automatically generate configurable options. 16. Good job! 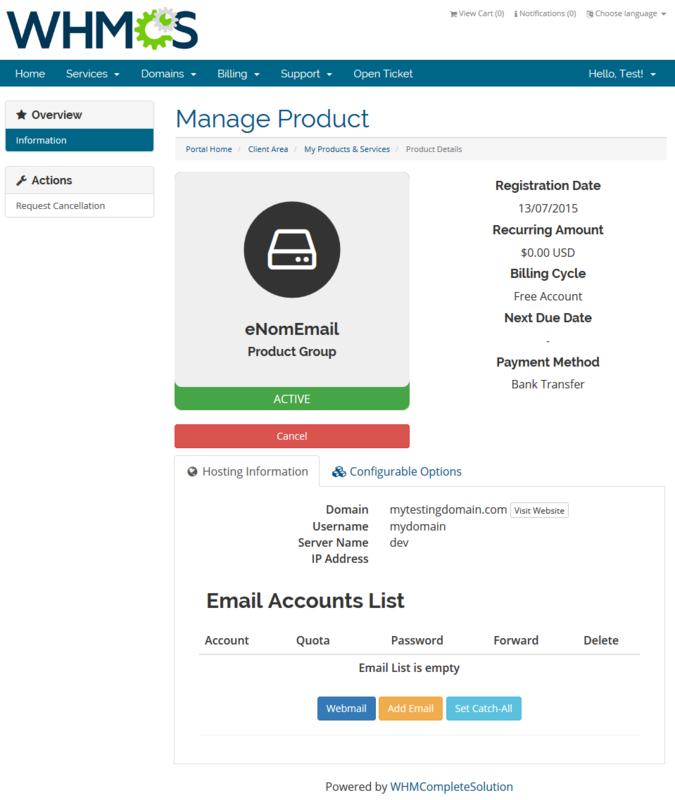 You have just correctly set up your first product with Enom Email. A successfully installed module will present similarly to the screens below. Enom Email allows your customers to manage their Enom Email accounts via client area in your WHMCS system. In this short guide, you will learn about all of the email accounts management possibilities that our module has to offer. 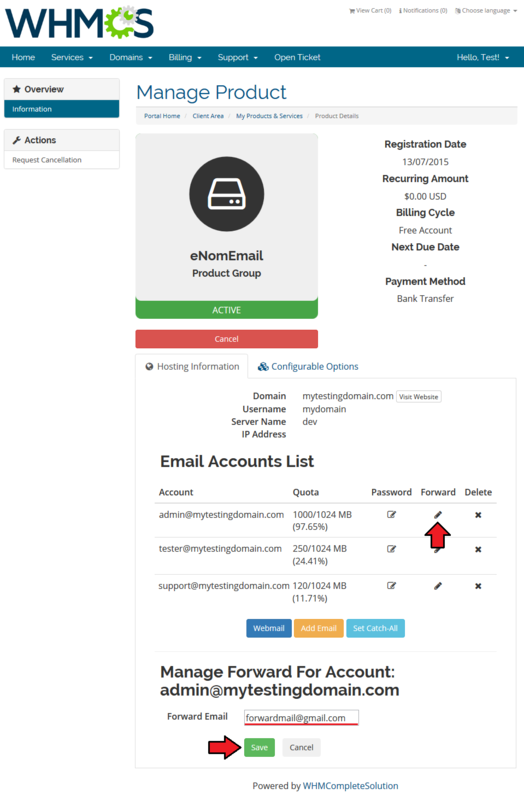 As you can see on the following screen, you can create/terminate Enom Email accounts of your clients, manage 'Quantity' and 'Capacity' of the single product. Note: visible on the screen 'Upgrade/Downgrade' option is not supported by the module, it is due to Enom API limitations. 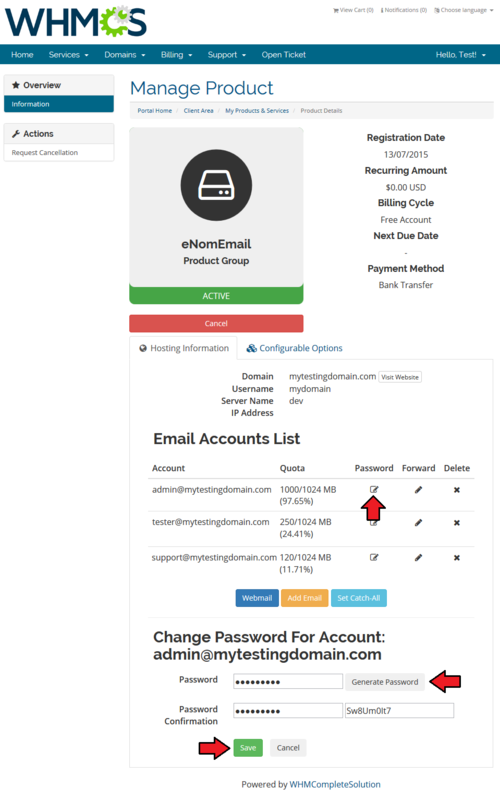 To add an email, press 'Add Email', provide email name and password, then confirm the password. Afterwards press 'Add Email'. Instead of typing in a password you can also generate it. To do so, press 'Generate Password'. The password, you have just generated, will be visible for you in the text box under 'Generate Password' button. 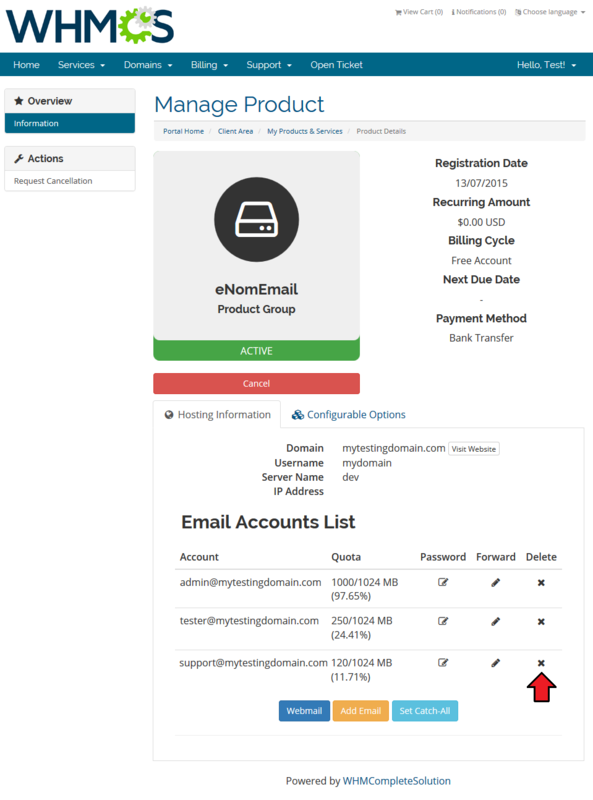 Our module allows your clients to manage their email addresses straight from WHMCS client area. In order to change the password, press 'Change Password' button as shown on the screen below. Afterwards, type in a new password manually or generate it through pressing 'Generate Password' button. To confirm the changes, click on 'Save' button. 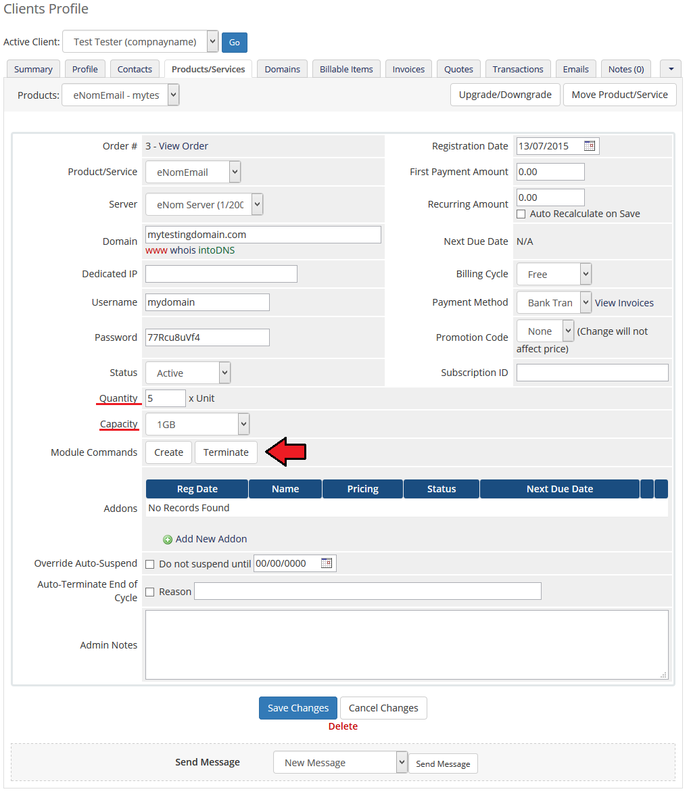 To set up email forwarding, press the button marked on the following screen. Afterwards, fill in email address to forward and 'Save' the changes. You can delete mailboxes by pressing a cross button as presented on the following screen. To confirm, press 'Delete' button. In order to access Webmail, press 'Webmail' button as it is shown on the following screen. Catch-All functionality allows you to forward all messages sent to non-existing mail boxes on your domain to a selected email address. 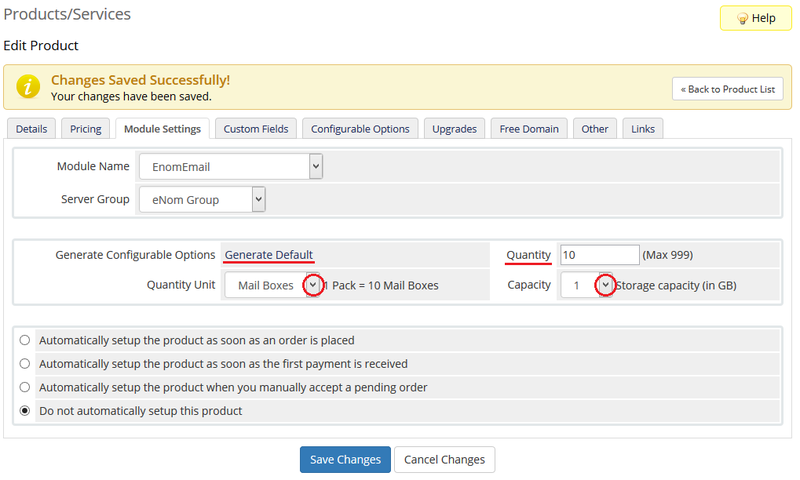 If configurable options have been generated, an additional section should be visible. 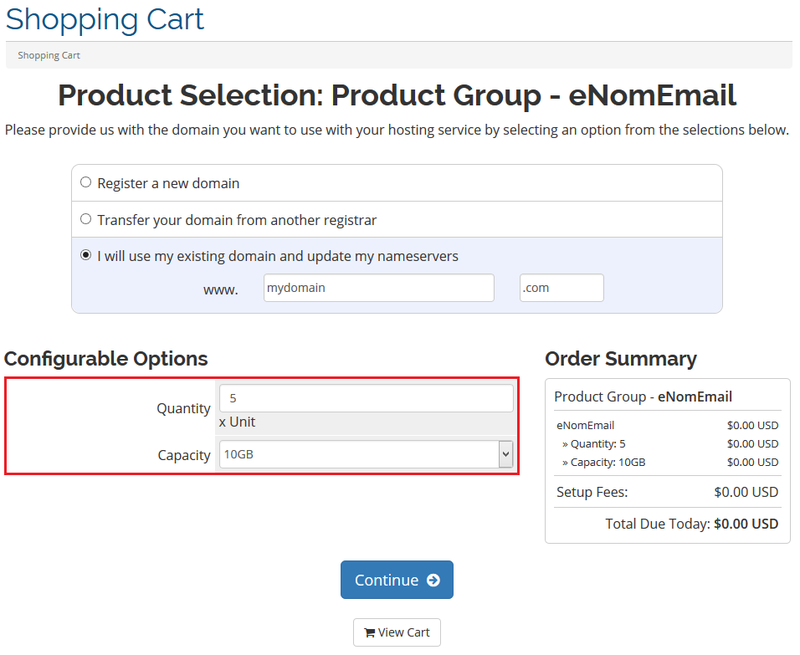 Due to Enom Email API limitations, we were forced to list all available TLDs. If you receive 'The TLD you were trying to add is not recognized. 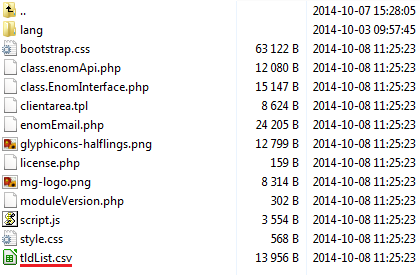 Put it into '/modules/servers/enomEmail/tldList.csv' file.' during create, add the TLD you were trying to use as described below. Edit 'tldList.csv' file located in 'your_whmcs/modules/servers/enomEmail/'. 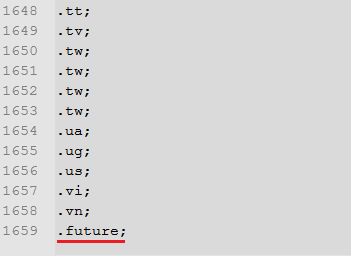 Add the TLD of the domain you wish to use at the end of 'tldList.csv' file. Remember to place it between a dot and a semicolon as it is visible on the following screen. 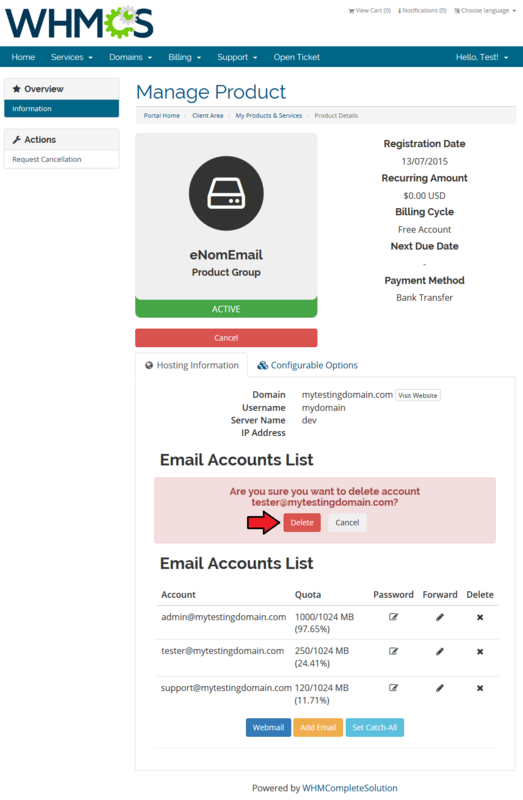 Now you should be able to create Enom Email account for the domain. 1. 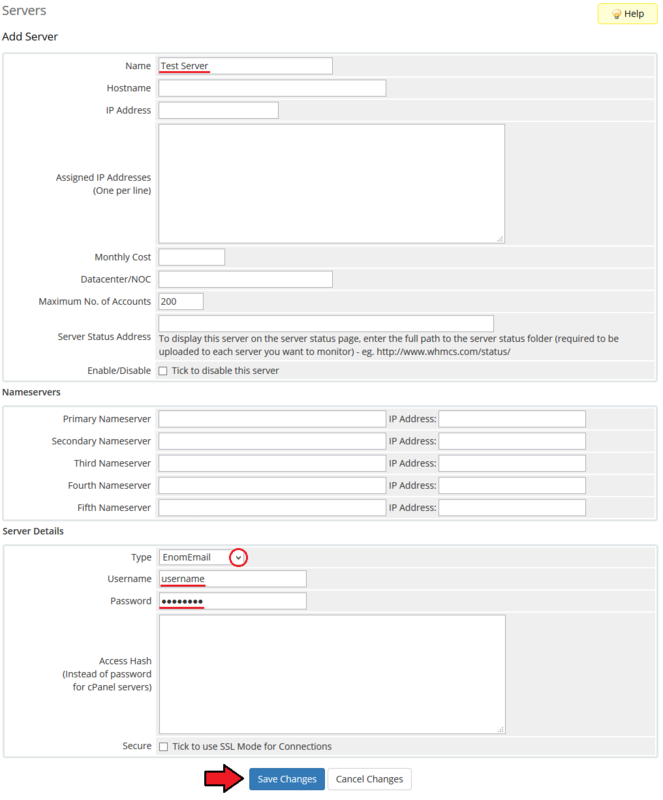 To use a connection with Enom test server, set up a server using 'dev' as a hostname and use your test account username and password. This page was last modified on 28 February 2019, at 15:47. This page has been accessed 76,632 times.